Beer: It’s What We Do. 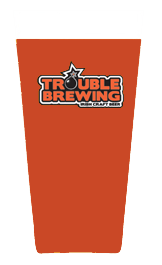 Here at Trouble Brewing we have our own unique take on beer. We brew beers of superior quality using the best ingredients and genuine craftsmanship. It’s beer born of taste and passion and not conceived in a science lab. We like our beer fresh. All our beer is delivered by us, straight to the door of the pub every week, so it pours as fresh as can be. We work hard to make sure that our kegs or casks aren’t kept waiting in storage unnecessarily and our beer lines are clean. We use water from our own well. It’s nice to have our own unique water supply and not have to rely on (fluoridated) municipal water to brew our beer. Our water takes a short journey of less than 10 meters from the well to the brew house. We only use the highest quality malts. We don’t use cheap adjuncts. We like hops and we’re not afraid to use them! 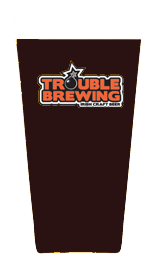 At Trouble Brewing we have four flagship beers, that we brew year round. Deception Golden Ale with its wonderful combination of subtle ale flavours with the crispness and mouth-feel of a lager. 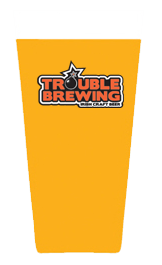 Sabotage IPA, with its in-your-face hoppy bite, of both citrus and spice and a strong, full body. Fuzzy Logic Wheat Beer, with its soft fruit flavours and hazy straw-like hue and not least, our award-winning Dark Arts Porter, with its big, complex malt profile and full chocolate, coffee and caramel flavours. Some beers go beautifully with certain seasons, so as the seasons change we brew our beers accordingly. Such as our Pumpkin Brew, a spiced beer brewed with real, home-grown pumpkins to celebrate Hallowe’en and Dash Away Cherry Chocolate Stout, a beer with an initial big kick of chocolate that leads to a finish of sweet cherry, perfect for the weeks leading up to Christmas (and beyond). There are endless different, wonderful and challenging styles of beer, which we brew in small single batch runs in order to explore new flavours and aromas, to challenge ourselves and also, occasionally, just for the hell of it. Agent Provocateur Rye Red Ale, Lazy Sunday Saison, Whistle Blower IPA, Big Bear Brown Ale, Chasing The Dragon IPA & Oh Yeah! American Black Ale, are just some of the beers that we’ve released in this range. These are the beers for the beer drinker that is after a taste of something brand new, bold and exciting.